It's that time of year again... roughly 10 weeks until Christmas and you're racking your brain about what your children could possibly NOT already have and where you'll find room to fit even one more toy into your home. I apologize in advance for introducing you to more must-have toys! I'm always on the lookout for adorable, fun, imaginative toys that Holiday will love and always want to share my annual favorites with my readers! This first one, I actually did a separate post on earlier in the year. It was a last minute add to last year's Christmas haul and worth every penny! This Melissa and Doug Ice Cream Cart comes loaded with wooden play food. The cart easily converts into a Hot Dog Stand with a quick flip of the front card and an ingenious pull of the canopy converts it to a yellow/red color scheme. This toy really is gender neutral and is a huge hit for every child who visits our home! So often I find myself loving toys that aren't necessarily easily accessible in the US, such is the case with Great Little Trading Company which is really one of my all-time favorite places to find adorable, unique toys. My dad was supposed to make Holiday a grocery stand last year for Christmas, but got absolutely swamped at work and I just couldn't find anything in the US I loved. Then I stumbled on this-- and it's ADORABLE in every way possible. GLTC ships many of their items to the US. It arrived two days after purchase from DHL Express Delivery. Make sure you convert Pounds to the US Dollar and the international bulk shipping was $154US. They have SO many cute toys and you you can fill your basket and still pay just the flat rate of 100 pounds ($154.40) for delivery. I purchased the grocery stand during one of their frequent sales, so it worked out to right around $350 total after shipping. Compared to what's on the market in the States, I feel like it's a great value for the money. 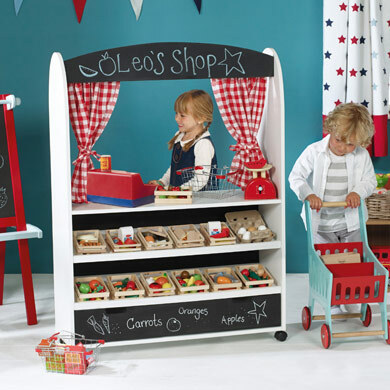 If you're in the market for the Grocery Stand or the Play Cafe (below), this "Toy Till" wooden register comes in red or pink and is the perfect accessory! A new addition to GLTC's lineup this Christmas is this AH-dorable Teacup Play Cafe! This one will work out to around $350 shipped to the US if you purchase while on sale (which it currently is). Don't tell my husband, but this is at the top of list to buy for Holiday for Christmas this year. (I know you read my blog honey, but don't worry, I know exactly where it's going to go)! We already have a Tea Trolley, but if you'd don't-- these from GLTC are absolutely adorable! I plan to add the red, wooden cash register to our list this year as well! Of course if you get the Cafe, you'll need this costume to go along with it! This one is a tiny bit big on Holiday, but it doesn't stop her from sporting it often and taking orders. It is made very well and the accessories are adorable! These Connect and Play Puzzle Sets from Hallmark and super fun! They are very simple 36 piece puzzles-- so great for your tiniest puzzle masters. However, the puzzles create adorable princess scenes and backdrops perfect for the little characters that come along with each set. As the title suggests, you can collect multiple sets and connect them together! Best of all, each set comes in an absolutely adorable metal "lunchbox" carrying case! I thought Holiday would lose interest in these quickly since the puzzles are so simple, but they have quickly become a favorite! And while we're on the topic of Cinderella, let me introduce you to Little Adventures costumes. This brand is carried at Target.com but not in their retail stores. We have several Little Adventures costumes and they are silky, soft, wash easily and beloved in our home. However, this Cinderella Day Dress takes the cake! For weeks, Holiday put this on every single morning and did her chores! I started homeschooling this year so I've been on the lookout for great educational resources, enter Little Passports. Little Passports is a super fun monthly subscription program. Packages range from $13.95 - $15.95/ month and come in several age ranges: 3-5; 6-10; 7-12. I've been checking out the 3-5 Category. When you sign up, your child will receive a fun suitcase, world map, luggage tag, activity booklet, stickers and wall decals. Then, each month, they'll receive a new shipment that explores a unique theme. Each themed package includes an activity booklet, souvenirs, flashlight adventures, stickers and wall decals. Some of the themes for the Early Explorers include: Landmarks, Music, Animals, Food, Art, Natural Wonders, Oceans and much more! If dress-up is a daily occurrence at your home, as it is ours, your little ones will loves these Dress Up Classic Cloaks from one of my favorite companies, Magic Cabin! They have several different styles if you search for "Cloak" on their site! Because picnics are almost a daily occurrence at our house, a proper, kid-size picnic basket is a necessity! A local children's play place has this super cute wooden, magnetic fishing set that Holiday LOVES to play with so I finally tracked it down to purchase for Christmas! You can cast and reel with the pole and then pick up the wooden fish which are magnetic. This same children's play place I mentioned above also has this Melissa and Doug Let's Play House Cleaning Set and Holiday won't put it down when she's there! We have a cute little pink broom and dust pan I picked up at Target several years ago, but this Melissa and Doug set has a lot more pieces she seems to enjoy. It's also on our list for this year! Nearly every little girl I know has Starlily on her Christmas Wish List this year! The latest and greatest from Fur Real Friends interactive toys. Definitely follow the link below to Amazon and watch the video so you can see her in action! Follow the above Amazon link to watch the video for Amazon. It's an interactive, creative thinking toy that works with iPad. I won't do it justice trying to explain it so CLICK RIGHT HERE TO WATCH THIS VIDEO Because Holiday likes to draw so much, I'm most interested in the refractive drawing tool that will put her drawings onto her iPad screen and enable her to animate and manipulate them on screen! My "Teacher Friend" Erin, introduced me to the Logic Puzzles a year or two ago and they've been a favorite at our house ever since! Each puzzle contains cards or booklets with more challenges of how to manipulate blocks to either look like the picture or to achieve a certain goal. There are several levels of difficulty within each set. The sets are really intriguing for little hands and minds and it's just one of those toys that is truly a learning resource. As your child plays with these types of toys, it's helping them to think in all new ways and you can just see the little wheels of their brains turning. Toys that make them smarter?!! Win-Win! We started with Bunny Peek-A-Boo, once Holiday had mastered all those levels, we moved onto Camelot Jr.